Belfast City Hall on Donegall Square North suffered damage to the roof and the ornate banquetting hall during the Belfast Blitz of April and May 1941. Photographers from the Belfast Telegraph captured the aftermath of the Belfast Blitz in 1941 when Luftwaffe bombs devastated the Donegall Square North area. 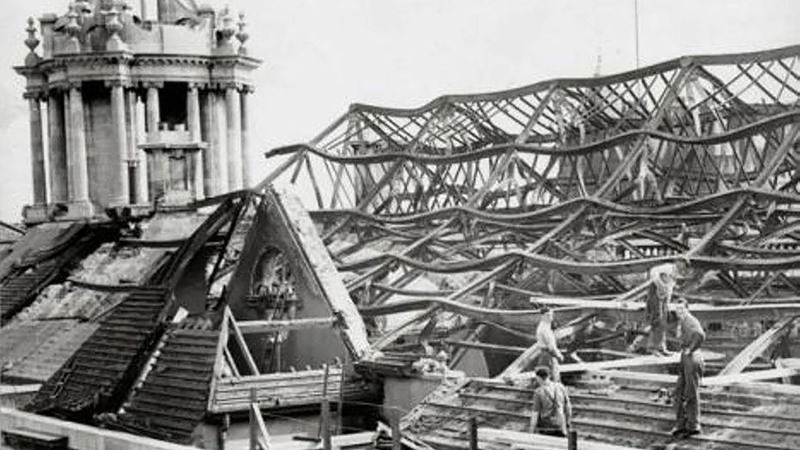 Belfast Telegraph Photo: A construction team work on the damaged roof of the Great Banqueting Hall at Belfast City Hall following the Belfast Blitz on the 4th and 5th May 1941. Copyright Belfast Telegraph. The following places will be of interest to anyone wishing to explore more of the square's World War Two heritage. If you enjoyed this post on "Donegall Square North, Belfast, Co. Antrim", please share with your friends and followers.